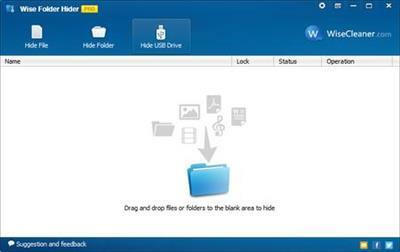 Wise Folder Hider protects your private and important data from others’ eyes. This application is designed as a free USB drive/ file/ folder hiding tool. User can use it to hide sensitive or important files and folders on local partitions or removable devices. The data can’t be accessed by other programs or other operating systems such as DOS. The only way to access or unhide these data is to enter the valid password. However, Wise Folder Hider is designed for home use only, but not recommended for commercial settings which require stricter confidentiality. Using this application, your private data and important files will not be exposed to others or unintentionally revealed and your privacy will not be pried into if you share one computer, USB drive, removable HDD drive, etc.